Welcome! CriminonT Means "No Crime" !! You can do something about prisons expanding indefinitely! Only 2% of a pilot group using this program returned to criminal habits; while the return rate in a control group not on this program duplicated the national average of 80%. Criminon activities and courses made this possible. If you know someone in prison, send them a course request, and have them send it to Criminon WUS, PO Box 9091, Glendale, CA 91226. If you know someone who needs help so they don't end up in prison, sponsor them on a course. Courses for those not yet inmates are $150 each. Contact Criminon West to enroll them. Both individuals and companies can sponsor a page! 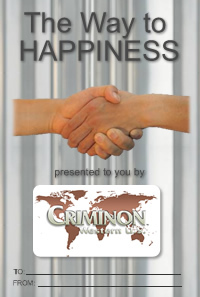 You can volunteer to help at Criminon. You can make a donation using PayPal or by sending a check. Help us NOW, and make true rehabilitation of criminals a reality! © CriminonT Western United States. All Rights Reserved.